Raisins and walnuts make this plum jam sticky, sweet, and crunchy – almost a paste, and wonderful with sourdough, whole grain toast or crumpets. 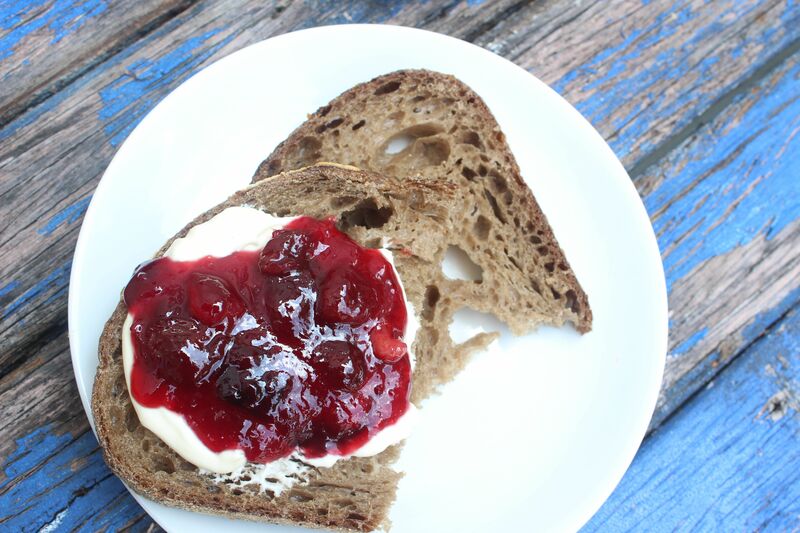 Great with butter or creme fraiche – I had the jam on Sonoma sourdough with creme fraiche. I make lots of jams all year round but summer is great for berries and stone fruit. Strawberries, raspberries, apricots and plums all make fantastic jam and conserves. Plums are so full of pectin that setting point is easily reached. Blood rums, with their ruby red colour, make beautiful jam. 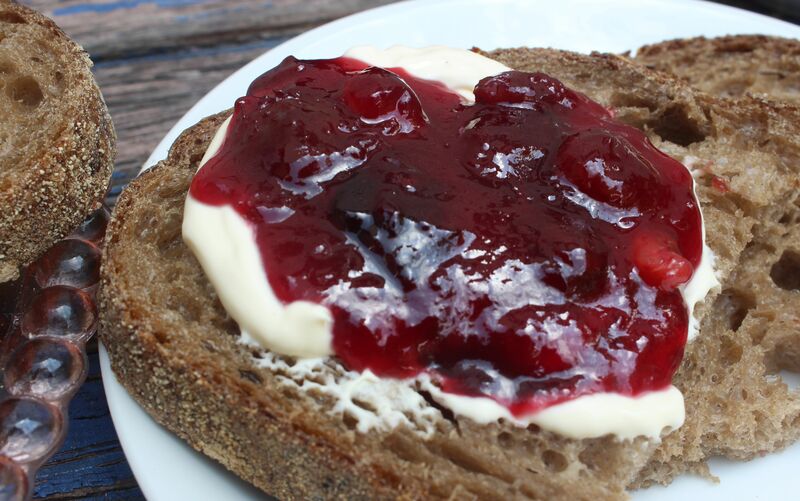 This jam is based on a plum jam from Jams, Jellies and Marmalades by Margaret O’Sullivan. Her recipe uses orange slices but being “orangeless” today I substituted lemon slices instead – equally delicious! Chop the plums and remove the stones. Measure the plums and raisins and lemon slices and add sugar equal to 3/4 of the amount. You will need to boil the lemon slices for about 10 minutes in water to soften – if you don’t mind a little crunch, just add as is to the plums and raisins. Put plums, raisins and lemon slices into a preserving pan and cook slowly for about 20-30 minutes, stirring frequently, until setting point is reached. Stir in the chopped walnuts. Pour into sterilized jars and seal. Posted in Breakfast, Jams, Marmalades, Conserves and Chutneys, Sweet Food and tagged conserve, creme fraiche, crumpets, jam, lemons, oranges, plums, raisins, sour dough, walnuts. Bookmark the permalink. 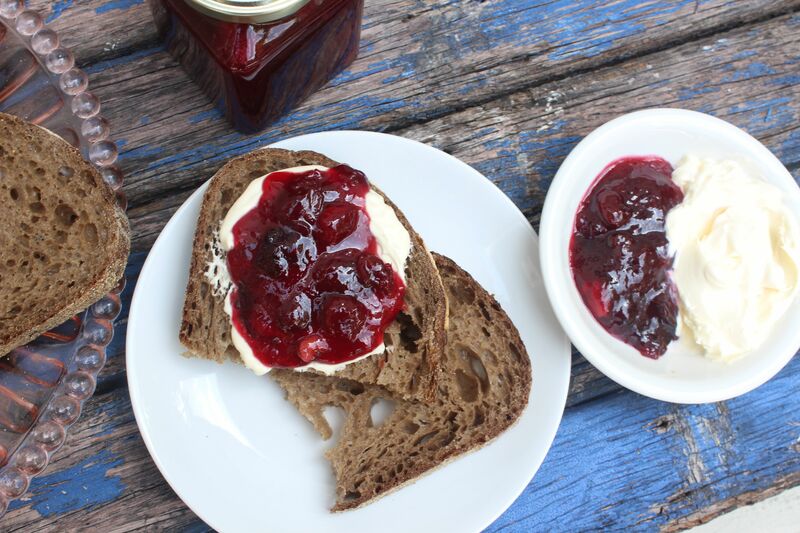 This jam looks wonderful, and since it’s incredibly cold in New York this winter and looks more like Siberia, I appreciate pictures that transport me back to summertime!